Four teams from the St Andrews club competed in the second round of the Secondary Shield. This tournament is open to all teams in the league except those in Division 1. New Kids (Division 2) were first up against Missiles (Division 3) at Forthill. Craig Fraser fired off the first point on the score sheet for Missiles, shooting down Kong Wan in three very tight sets before Howard Lee equalized for the Kids against David Hunter. Missiles self-destructed in the next two matches before Craig returned to the table with too much ammunition for Ken Falconer. In this first-to-five race, New Kids were only one point ahead with up to four matches remaining. However, the Kids had too much firepower as they torpedoed the next two matches without conceding a game to qualify for the next round. Swots were also facing a lower division team: the Lairds, at Ward Road gym in Dundee. This was a much more straightforward affair. Taking no prisoners, Swots triumphed 5-0, and were only once pushed to a five-game match. Dave Beveridge, Collin Bleak and Nick Shepherd confidently qualified for the next round of the competition. Finally, a St Andrews club derby rounded up this stage of the competition at the Victory Memorial Hall. Prospects (Division 3) the home team welcomed the Truants (Division 2). Sandy Pearson (Prospects) opened the fixture with his first appearance since a knee injury but lost in straight games against Sascha Roschy. Charlie Ross did well to come back from 2-1 down against Knut Radmer to level the match at 1-1, keeping the prospects of the Prospects alive in the contest. Truants, however, had other ideas and snuffed out any hope by taking four consecutive matches to qualify for the next round. Both teams were keen to make the most of the night and decided to play out the rest of the fixture. Truants consolidated their dominance as they picked up the next two points. Despite his dodgy knee, Sandy managed to take the last point against Knut, giving a final score line of 2-7. Sandy reflected in a post-match interview that he had returned to the table a bit too soon after his injury. We wish him a full and prompt recovery. St Andrews has three teams through to the quarter finals, and all playing opponents from different clubs. Watch out for some more local derbies if they progress further to the semi-finals and final in the Secondary Shield. This entry was posted in Match reports, St Andrews Table Tennis Club on October 23, 2018 by standrewstt. In Division 2, Truants welcomed the Lundin Lasers from Lundin Links to Gauldry last week. It was a real game of cat and mouse all night, both teams taking the lead in turn. At 4-4, Dave Beveridge (reserve) landed a crucial blow for Truants against former team mate Robert Brown to put Lasers on their back foot for the final encounter of the night. Stalwart Graham Wood then secured the victory for Truants and a personal hat-trick with a straight sets win against Roman Nydza. Gritty Knut Radner’s positive attitude at the table finally paid off as he at last scored his first point of the season. Also in Division 2, the top two teams clashed at Forthill where New Kids were ambushed by a rampant Villa. In a very one-sided encounter, Villa took all the singles matches, only conceding the doubles in the deciding game by the smallest of margins. The hapless New Kids were stunned by superior opponents on the night. Howard Lee and Ian Smith were only able to take a bit of comfort from holding on to their unbeaten run in the doubles so far this season. In the final match in Division 2, Swots hosted Sputniks. Although the man of the match, Jack Oughton, was on Sputniks’ side, the guests were sent into orbit in a convincing display by Swots. Even then, Jack won 2 of his 3 matches in a deciding set. Nick Shepherd, Collin Bleak and Dave Beveridge for Swots all managed to surpass Carol McLean and Eric Brown, who only won one set between them. Swots’ 7-3 victory means they are now 3rd in the second division, ahead of New Kids after their capitulation to Villa. Prospects, representing St Andrews in the third division, travelled across the river Tay to play Squires at Ward Road Gym. Charlie Ross for Prospects opened the score against Winnie Stein, but the hosts took the next four matches, establishing a commanding 4-1 lead. Neil Lea reported feeling unwell during match against Winnie, but it took all of Dave Goddard’s powers of persuasion to convince his team mate to forfeit his third match. True team spirit does not mean winning at all costs, in this case Prospects were happy to reduce their chances of victory to protect one of their own. One for all, all for one. Prospects played catch up with Squires from there, but only reduced the deficit to 4-6 in the end. This entry was posted in Match reports, St Andrews Table Tennis Club on October 16, 2018 by standrewstt. In Division 3 last week, Prospects welcomed the Earls from Dundee. It was raining both outside and inside the Victory Memorial Hall due to a leaky roof. Despite the meteorological hazards, the teams did their best to ignore the water ingress in a hard fought affair with 6 of the 10 matches needing a deciding game. The Earls poured down their shots as they raced to an early 3-0 lead. Not to be inundated, Dave Goddard and Charlie Ross reduced the deficit by soaking up the pressure in five game thrillers as they beat respectively Stewart Mason and Jamie Harle. Eddie Dougan, however, kept his cool for the Earls and swamped Neil Lea 3-1. In the doubles, Dave and Charlie combined well to overcome Stewart and Eddie. Earls then secured the next two singles to steam to victory. As the precipitation subsided, Charlie returned home for a well-deserved shower after claiming the last point of the night with a deluge of fine shots to defeat Eddie. Final score 4-6 to Earls. In Division 2, Swots travelled to Lundin links to take on the Lundin Lasers. Swots started slowly, going 2-0 behind, but rallied to take the lead back at 3-4 before the hosts took the next three matches, securing a narrow 6-4 victory. The performance of Roman Nydza from the Lasers was decisive as he picked up all three singles in the deciding fifth game. Highlights for Swots included a win for reserve Chris Wroniecki and two victories for Collin Bleak in addition to the doubles match with David Beveridge. It was a fine performance for first division Prefects in the Chairman’s Challenge trophy against Defenders. The opening two points were shared evenly by the teams. Reliable as ever, Michael Hahn then put the Prefects in front with a straight set win and received help from Bonifac Legrady for the first doubles match of the night. With their backs to the wall, Defenders had to win the next doubles to stay in the match, which they did when Arthur Pritchard and Jos Berkhout beat Bonifac and Jean-Augustin Touton in straight sets. Michael needed only one opportunity to secure the victory and therefore qualification for the next round when he beat Jos 3-1. This entry was posted in Match reports, St Andrews Table Tennis Club on October 9, 2018 by standrewstt. It was another good week for teams from St Andrews. New Kids welcomed Kingsway from Dundee Fire Station at the Victory Memorial Hall. Despite losing the first match, when Derek Thomson beat Kong Wan in four games, the home team never looked like losing the fixture as they won the next seven matches for the loss of only three games. It was Derek Thomson again who broke the winning streak to take his second and Kingsway’s only points on the night by beating Ian Smith in the fifth and deciding game. Howard Lee scored his first hat trick of the season, dropping only one game on the night. Ian and Kong tallied two victories each as they extinguished the flames of firemen Willie Cooper and Alan Carrie. The final score was 8-2 for the hosts. After two matches New Kids (temporarily) lead Division 2 sharing the top spot with Villa. On the other table, Prospects were facing Comets from Broughty Ferry but with a very different outcome. Guests Glenn Christie, Fraser Smith and Dougal Ogilvie were only ever troubled when Chris Wroniecki was on the other side of the table, as they were pushed to deciding games on each occasion. Chris will be relieved to take the one consolation point in a 9-1 reversal but disappointed to have lost three encounters by the smallest of margins, including the doubles. In the singles, Dave Goddard and Neal Lea were reduced to cosmic dust, winning only one game between them, against a dominant Comets team. In Division 1, Jean-Augustin Touton made his debut for Prefects and saved the team from an away defeat against Star in the last game of the night. Michael Hahn won his singles and Graham Wood (reserve) scored another point for the visiting team. Star were represented by Ian Martin, with two victories as well as the doubles, and Jim Hutcheson, who won one single, as did Andy Ferguson. Overall, the 10 points were evenly shared between the two teams. Finally, Truants, who were away at Forthill in Broughty Ferry playing Tigers, returned home victorious 6-4. Sascha Roschy lead the charge with a hat trick, as well as the doubles, partnering with Graham Wood who added two more victories to the score sheet, beating Kenny McLaren and Scott Thomson, but losing to Logie Anderson. Unfortunately, Knut Radmer was unable to tame the big cats despite two very close matches against Logie and Kenny. 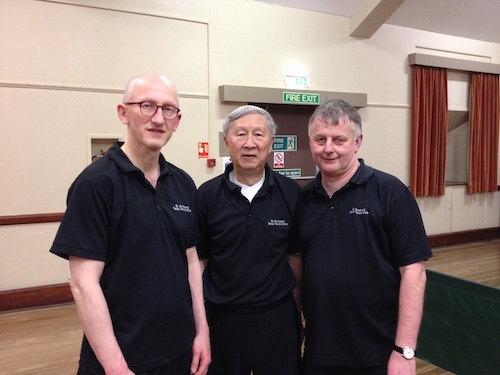 This entry was posted in Match reports, St Andrews Table Tennis Club on October 2, 2018 by standrewstt.